BANGKOK (9 Nov 2018) – It was a really long, long night for Timor Leste as striker Adisak Kraisorn blasted six personal goals for a 7-0 win in their opening game of Group B of the AFF Suzuki Cup here at the Rajamangala National Stadium. 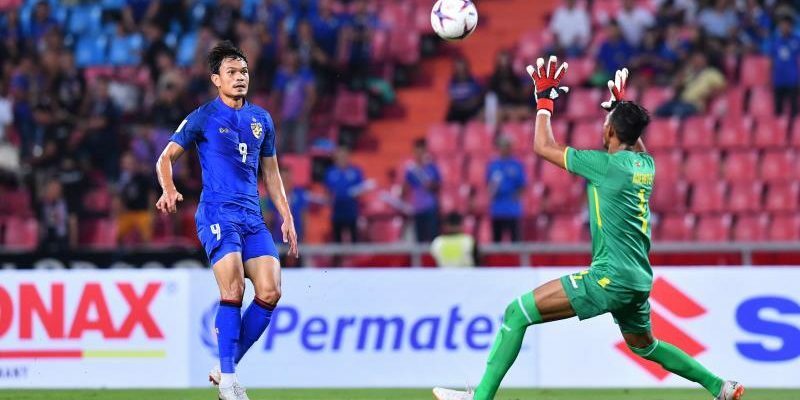 Bereft of their better known stars likes Teerasil Dangda and Chanatip Songkrasin did not affect Thailand one bit as they controlled much of the possession and never let their foot off the pedal. “We were very serious about this match and we were not taking them easy at all,” said Thailand head coach Milovan Rajevac afterwards. “Timor gave us a hard fight which we expect and the way they played, was what I had thought that would do. That suits us fine. And while the support at the stand may not be what it should be considering the persistent rain throughout the day earlier, still Thailand put up their best foot forward to press Timor Leste hard in the opening exchange. The lanky Adisak did not take too long to show that he is back at his best following a lay off due to injuries with a typical strikers’ goal early in the third minute making good on a flick from Nurul Sriyankem. Ten minutes later, Adisak doubled the advantage latching on to a cross from deep while at the half hour mark, he made it 3-0 off a fou-man effort. Thailand then trooped off into the break comfortable with four goals ahead as Adisak nodded home a corner. “The players played below par tonight. The Thai team is a strong team and they showed it,” said Timor Leste head coach Norio Tsukitate. Timor Leste were not at all defensive as they tried to get back into the game in the second half. But their haste to push forward left gaps at the back and Adisak did not further invitation to add the tally as he slammed in the fifth goal of the game just five minutes after the restart. Six minutes later, Adisak converted a penalty to complete his double hat trick of the night. But as the pressure piled on, Timor became increasingly disorganised as several exchanges later saw goalkeeper Aderito Fernandes picking up his second yellow card. The exchange for Supachai Chaided for Adisak saw Thailand then finishing off a fine night with the seventh goal of the game as he squeezed in between his markers to score.